Overheating symptoms are as follows: • The high temperature indicator comes on or the engine suddenly loses power. Keep the engine running and open the hood. Turn off the engine and wait until it subsides. ► If the cooling fan is not operating, immediately stop the engine. 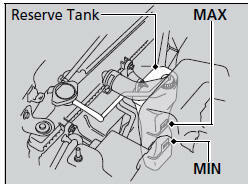 ► If the coolant level in the reserve tank is low, add coolant until it reaches the MAX mark.